Goitrogens are naturally occurring substances that can interfere with thyroid gland function by inhibiting iodine uptake which is a critical nutrient for hormone production. They get their name from the term "goiter," which means an enlargement of the thyroid gland. If the thyroid gland is having difficulty producing hormones due to lack of iodine, it may increase in size (goiter) in an effort to filter more blood to get more iodine. If eaten in excess, they can interfere with the healthy function of your thyroid gland, also known as the master gland because it controls and regulates the other glands. At present there is not enough research on the relationship between goitrogenic raw foods and thyroid hormone deficiency to make any definitive statements. Most health care practitioners seem to subscribe to the opinion that those without existing thyroid problems would be fine in consuming goitrogenic foods as long as consumption is not excessive. And since they block absorption of much needed iodine by the thyroid, eating some foods high in iodine such as sea vegetables can help support good thyroid function. It’s important to point out that these foods also contain a great many nutrients that affect the body in a positive way and should not necessarily be avoided. It comes back to eating a wide variety of foods and being aware of the reasons for it. When we eat with the seasons we naturally eat a varied diet and with a little common sense avoid the pitfalls of over-consumption of any one food. Research does show that steaming or otherwise cooking foods containing goitrogens does deactivate a good portion, if not all. Of course many of the other nutrients are lost as well, which is why many follow a raw food diet to begin with. 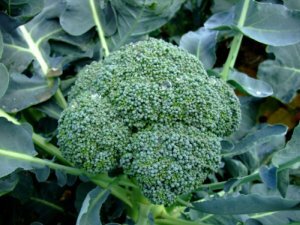 Cruciferous vegetables are usually associated with goitrogenic content, but as you will see in the list below there are other common raw foods that fall into this category as well. Many chemical additives in foods like soy products as well as fluoride and chlorine can have a goitrogenic effect on the human body. Just another reason to read labels, drink pure water and have a good filter on your shower.